As I warned, this is going to be a short one. There are, essentially, three reasons for this. One, the past month has been exhausting enough, politically. Two, it was a textbook example of a "one-issue month" where only one story dominated. Three, sometimes I am inherently lazy, and I guess you can call this one of those times. Sorry about that. The easy answer to the question: "Who 'won' the debt ceiling debate?" is: nobody. The public sees everyone involved in a more negative light than when the whole manufactured crisis began. Hopefully, politicians will take note of this, but it is quite likely they will not, and this new standard of brinksmanship will become the norm, every time the debt ceiling debate arises. There's a comforting thought, after the past month, eh? But while both Congress and the Republicans were scoring record lows in the polling, we're not concerned with them here, just with President Obama. 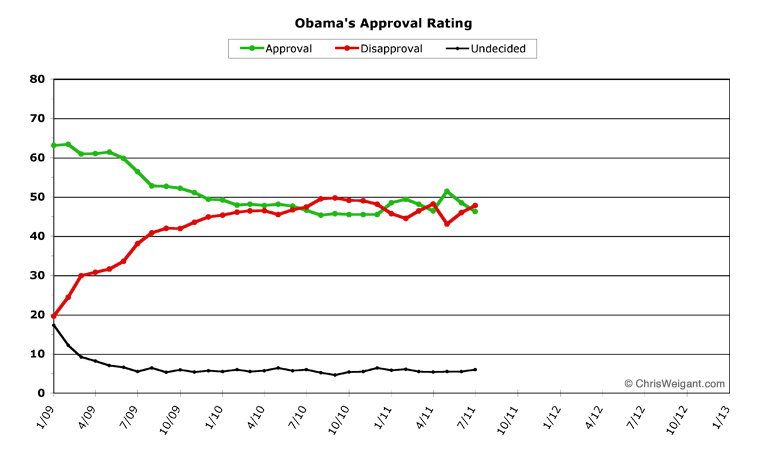 And Obama had his own sort of "double dip" this month in the polls. He started off the month with his poll numbers still sliding back down after his "Bin Laden bounce" of a few months back, but his numbers were starting to stabilize. This held for about a week or so, but by mid-month the debt ceiling fracas was the main story on the news, and Obama's numbers slid downwards. This puts Obama in the worst shape he's ever began a month, looking forward to August, but since the debt ceiling deal was struck he shows signs of bouncing back a bit. But let's look at the new chart for July, to begin. July began with more bad news on the unemployment front, as the official rate ticked upwards another tenth to 9.2 percent. From this inauspicious beginning, things descended into the mire of the debt ceiling debate. President Obama did actually show some spirit in this extended brawl, and for the first time in his presidency actually used the bully pulpit to rouse the populace. But, as I said, everyone got dragged down into this muck, in the end. Obama ended the month with an average 46.2 percent approval, and 47.8 percent disapproval. This was significantly down from last month. While these numbers are far from the worst monthly averages Obama's ever posted, the daily numbers were even worse (more on that in a moment). August is, as I mentioned, the silly season of politics. Nobody knows what inane story the mainstream media will waste entire weeks chasing, but you can bet your hat it'll be a silly one. Augusts haven't been kind to Obama, however, at least when it comes to public opinion. His worst-ever monthly drop in numbers came in August of 2009, and the August after that he hit his lowest monthly approval rating of his presidency. Perhaps he'll be able to buck the trend this year, though. Obama's monthly average wasn't the worst of his presidency -- he has returned to almost exactly the point he was at before his "Bin Laden bounce." But his daily numbers are even worse, which means he's going to have some headwinds heading into August. Obama came very close to hitting the lowest daily approval he's ever charted (44.2 percent, on 10/17/10), two days before the end of July, when he hit a dismal 44.6 percent average daily approval. His disapproval numbers weren't quite as bad, hitting a high of "only" 50.3 percent for the month -- almost a full point from his worst daily average ever (51.2 percent, on 9/26/10). Still, that's got to be worrisome for the folks who work at 1600 Pennsylvania Avenue. The first week of the month wasn't too bad for Obama, as he continued on the plateau he'd ended June on, for both approval and disapproval. But he hit the crossover point where his approval was "underwater" (less than his disapproval) immediately afterwards. He spent the second week bouncing back and forth from being even, being above water, and being underwater, but then for the rest of the month the public's mood turned increasingly sour. He ended the month with among the worst numbers he's ever posted at month-end -- meaning he'll start out August even deeper in the hole than the chart shows above. But that's not to say bad numbers in August will be a foregone conclusion for him. Like the killing of Osama Bin Laden, the debt ceiling debate concluded at the absolute beginning of a monthly period. So he won't have any drag left over from the "will there be a deal?" fingernail-biting which has occupied the airwaves for two solid weeks now. Obama's team is going to try as hard as possible to "pivot" to the jobs crisis at this point, but they also tried to do that after the budget deal worked out earlier this year, to no noticeable effect. August is looking like an uphill climb for Obama, no matter how you slice it. ObamaPollWatch.com is an admittedly amateur effort, but we do try to stay professional when it comes to revealing our sources and methodology. All our source data comes from RealClearPolitics.com; specifically from their daily presidential approval ratings "poll of polls" graphic page. We take their daily numbers, log them, and then average each month's data into a single number -- which is then shown on our monthly charts here (a "poll of polls of polls," if you will...). You can read a much more detailed explanation of our source data and methodology on our "About Obama Poll Watch" page, if you're interested. Option A gets my vote, too. Best of luck with the book writing process - I can hardly wait for the final product! How does B (a re-run) get to be easier than C (a null-string or short placeholder, below which we have a comments thread)? It would seem as though you could cut-and-paste a couple words like "open thread" just as easily as you can cut-and-paste an old article. If you have questions in mind to pose as one-sentence articles at the top of an open thread, go for it. If you have old posts in mind to post as re-runs, go for it. But as far as my vote is concerned, the default is A, nothing on T&Th. Could you have made that post any longer? Sorry, couldn't resist - I'm not that strong. Dang, bad proofreading there. Mea culpa. I fixed it -- switched the "B" and "C". Both are about as time-consuming in terms of posting, but "B" requires a long search through the past years' worth of articles to find the ones worth re-running, so it's the upfront time added on that I'm talking about. C would actually be pretty easy. Let's see what others have to say about it. But thanks for pointing out my editing error. It should read correctly now! It seems as though there's likely to be plenty of fodder for quick and easy one-line posts, like "Hey readers, what's your latest reading of the Tea leaves for the Republican presidential primaries?" or "Readers, post your favorite silly-season what-passes-in-the-MSM-for-news story." Or even combine the options: "Readers, which posts from the vault here at CW.com would you like to see as a re-run the top of an open-thread posting?" I'm thinking of retracting my previous assessment of Mitt Romney. You guys are missing the point. Geesh! Chris is writing a book and he needs a little break from us. Hey, writing a book is as good an excuse as any. Besides, don't you think he's earned it and then some!? So, what do you say - VOTE TO GIVE CHRIS A BREAK! Okay, okay, okay ... I wouldn't mind a break from us, either. Good point.. :D On the other hand, setting up a little Tues/Thurs playground for us wouldn't be too time-consuming. Egon:"I'de like to give the mother a gynecological exam." It's Jimmy Carter all over again.. So, what do you say - vote to give Chris a bunch of cheap-and-easy page-loads. Am I the only one who notices this?? Oh, Debbie Wasserman-Schultz. Makes much more sense than Dan Wylie-Sears. I don't think there's any danger of me being mistaken for a "Dem(i)God", or even for "the latest" anything, for that matter. I don't think there's any danger of me being mistaken for a "Dem(i)God", or even for "the latest" anything, for that matter. i'm okay with either A or C; for me the deciding factor would be how much effort option C would actually require on CW's part. if option C can be done in five minutes a shot, then i say do it. regarding the polls, i think the president has already lost just about everyone he could have lost, so the polls won't sink much lower. in my view, the only way he gets re-elected is to start fighting harder for the left. it's an energized base that does the campaign work, and most moderates will respect someone who takes a stand for something he believes, much more than they'll like someone who insists on trying to be "reasonable" when no one else will.